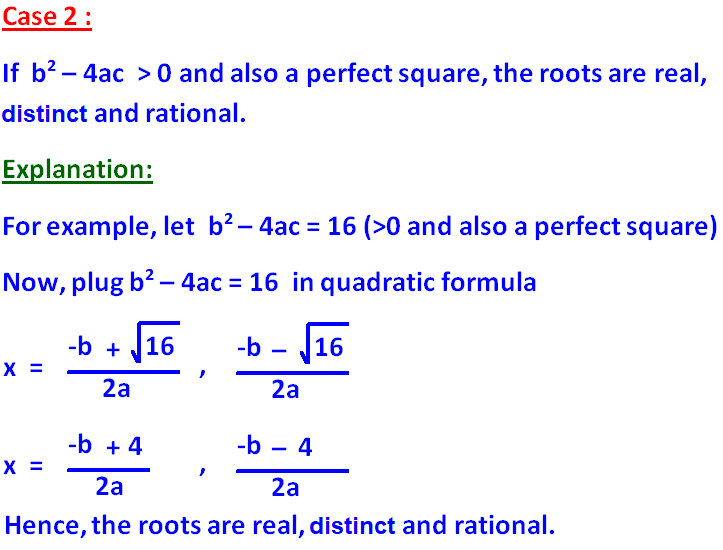 About "Nature of the roots of a quadratic equation"
"Nature of the roots of a quadratic equation" is the stuff which is required to the students who study math in school level. To understand the nature of the roots of a quadratic equation, let us consider the general form a quadratic equation. To know the nature of the roots of a quadratic-equation, we will be using the discriminant "b² - 4ac". 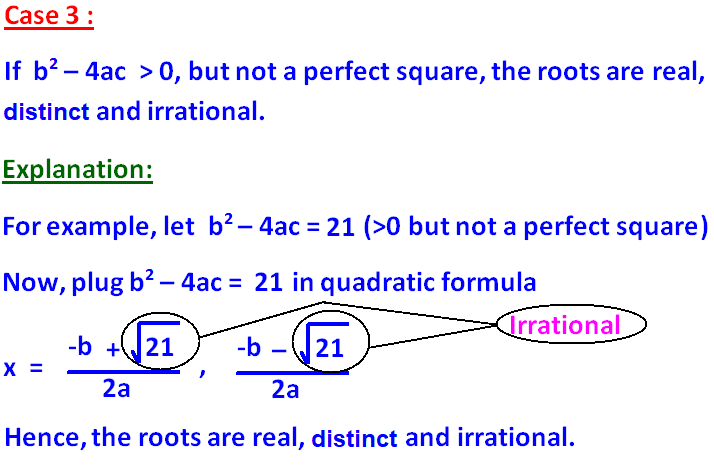 Because "b² - 4ac"discriminates the nature of the roots. Let us see how this discriminant "b² - 4ac" can be used to know the nature of the roots of a quadratic-equation. 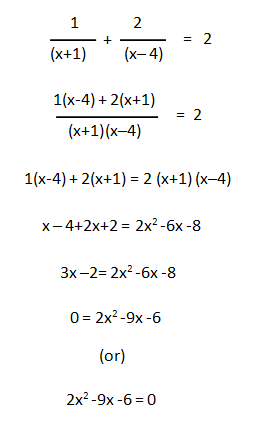 Examine the nature of the roots of the following quadratic equation. we get a = 1, b = 5 and c = 6. 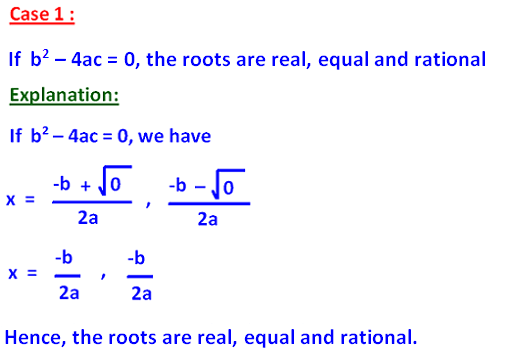 Now, let us find the value of the discriminant "b² - 4ac"
Hence, the roots are real, distinct and rational. 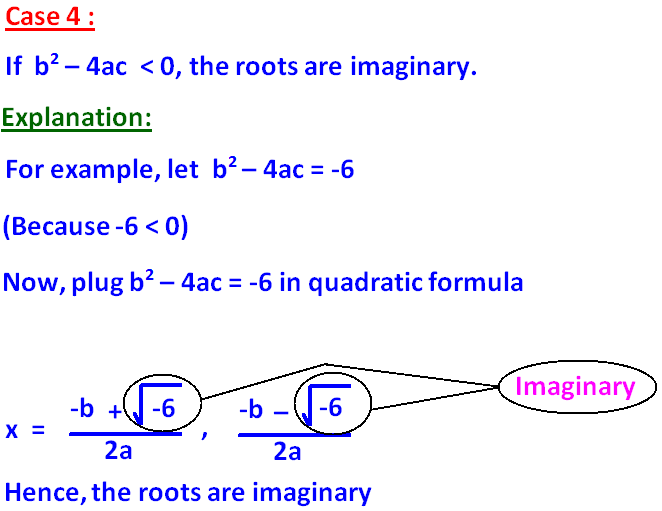 Let us look at the next example on nature of the roots of a quadratic equation. we get a = 2, b = -3 and c = 1. Hence, the roots are real, distinct and irrational. 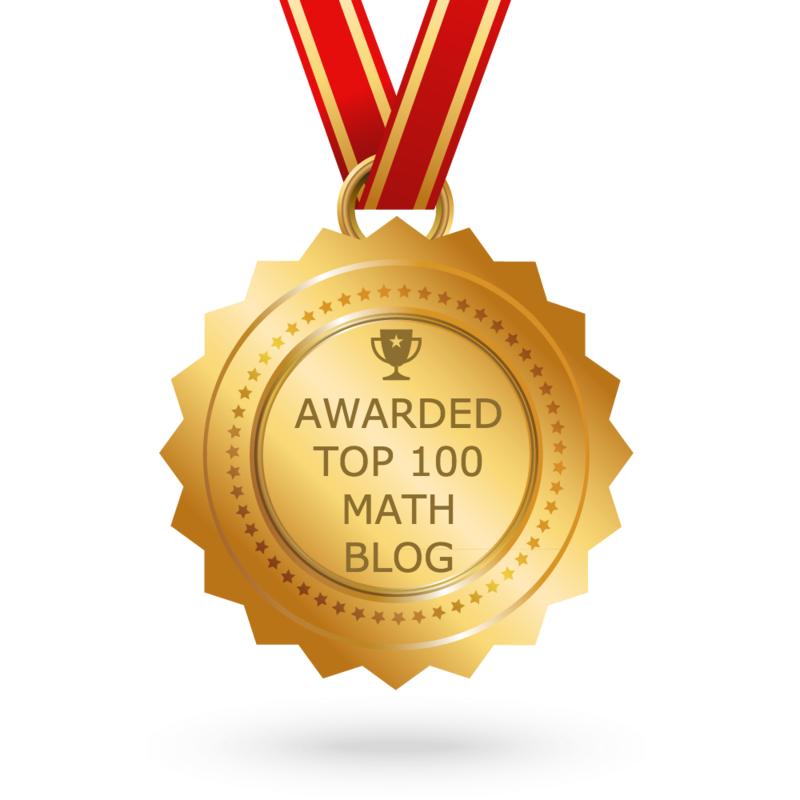 we get a = 1, b = -16 and c = 64. Hence, the roots are real, equal and rational. we get a = 3, b = 5 and c = 8. Hence, the roots are imaginary. If the roots of the equation 2x² + 8x - m³ = 0 are equal , then find the value of "m"
we get a = 2, b = 8 and c = -m³. Hence, the value of "m" is "-2". If the roots of the equation x² - (p+4)x + 2p + 5 = 0 are equal , then find the value of "p"
Hence, the value of "p" is " ±2 "
If the roots of the equation x² + (2p-1)x + p² = 0 are real , then find the value of "p"
Hence, the value of "p" is less than or equal to "1/4"
If the roots of the equation x² - 16x + k =0 are real and equal, then find the value of "k"
Hence, the value of "k" is "4"
First, let us write the given equation in general form. we get a = 2, b = -9 and c = -6. We hope that the student would have understood the problems and solutions given on "nature of the roots of quadratic equations". 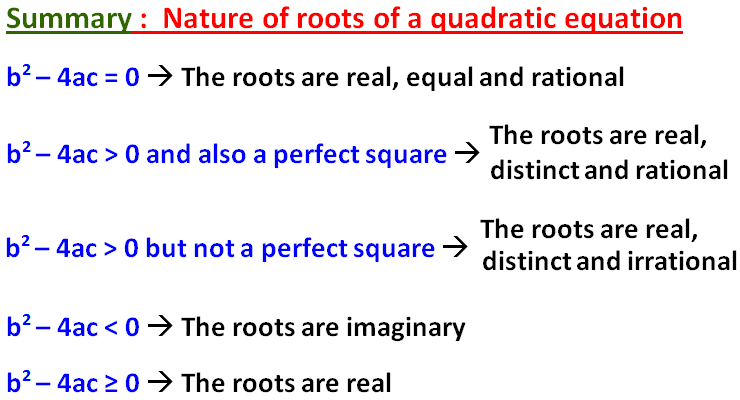 Apart from the stuff and examples given above, if you want to know more about nature of the roots of a quadratic equation, please click here.